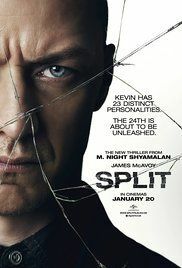 Three teenagers, Claire, Marcia, and outsider Casey, are kidnapped and held captive by "Dennis", one of 23 personalities present in the mind of Kevin Wendell Crumb, a victim of childhood abuse diagnosed with dissociative identity disorder. Over the years, Kevin has been treated by his psychiatrist Dr. Karen Fletcher, and appears stable: within his mind, all of his personalities sit in chairs in a room, waiting for their turn "in the light", i.e. controlling the body, while "Barry" controls who gets to go in the light. Two personalities, "Dennis" and "Patricia", are kept out because of Dennis' voyeuristic tendencies and obsessive–compulsive disorder, and both personalities' worshiping of "The Beast", a rumored 24th personality. Read more on Wikipedia.